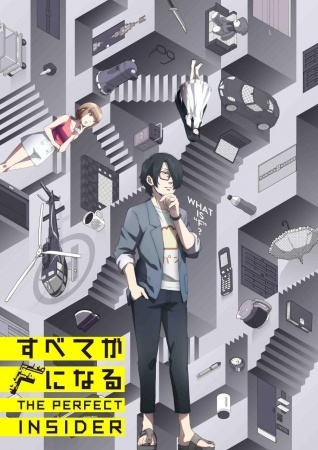 Here are the anime based on light novels that will be airing in Japan this season (with links to their English simulcasts — I will update as more are potentially announced). What shows are you going to watch this fall? For a general chart on fall anime, visit AniChart.net. The 35th Test Platoon of Antimagic academy, they’re one of squads enrolled at academy specializing in raising the witch hunters, whose job is to find, neutralize any magical threats! Unfortunately they’re a group of failures nicknamed “Small Fry Platoon,” a platoon formed from bunch of self-centered people who can’t cooperate and have personality problems. Will they manage to overcome their weaknesses and shine as the strongest platoon? Yotaro Hanafusa is a descendent of the “Knights of the World.” With the Knight’s Code of Chivalry hammered into him since childhood, Yotaro cannot stop himself from saving damsels in distress. He wears a mask, and is known on the street as “Knight Lancer” but he has always kept his identity a secret. While on an outing, Yotaro saves a 6-year-old girl, Makio Kidoin, the only child of a powerful business tycoon. When Yotaro discovers that Makio leads a lonely life in a huge estate, he resolves to protect her. He and his friends disguise themselves as lodgers and move into her mansion. The “final season” arc of the Monogatari series. The anime will cover the “Ougi Formula,” “Sodachi Riddle,” and “Sodachi Lost” chapters from the first novel, as well as the “Shinobu Mail” chapter from the second novel. In a hidden school surrounded by mountains, young ladies of good families are taught everything a high class lady needs to know. They are also completely cut off from the outside world, keeping them sheltered and innocent; however, a problem has come up recently—more and more graduates are failing to cope with the modern world after graduation. To deal with this problem, they’ve decided to kidnap a male commoner student, and enroll him as a student. They hope that this will be a gentle way to introduce the girls to the outside world. Kagurazaka Kimito is chosen for this dubious honor, mostly because he seems utterly average; however, the school leaders also seem to have concluded he’s a homosexual with a muscle fetish. When Kimito hears that the alternative may be castration (to protect the girls’ purity), he eagerly plays along with this misconception. Now he’ll just have to survive the attention of many high class young ladies that are completely out of touch with the world! I have read “Heavy Object” and Chivalry of a Failed Knight (which is not a harem but romance with probably the best couple of the season). I will also check Beautiful Bones: Sakurako’s Investigation.